The mystery of a missing memorial plaque to victims of the Titanic disaster has been solved. The British Titanic Society, which erected the plaque in Southampton in the 1990s, had initially believed it had been stolen by metal scrap thieves. 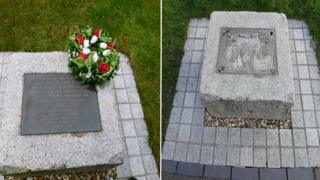 Now Hampshire Police have confirmed the plaque was "taken to safety" by staff from Associated British Ports (ABP). Officers said the plaque had fallen off its plinth. A force spokeswoman said: "ABP staff were in the docks near the memorial and saw the plaque had fallen off the plinth so they took it away to safety to make sure it wouldn't get taken by thieves." The British Titanic Society has been notified and the plaque will be returned. The plaque was erected in 1993 at the entrance to Dock Gate Four near the area where the liner departed on its fateful maiden voyage. The memorial had recently been moved to the redeveloped Vokes Park.